Dominic Calvert-Lewin’s first half goal was enough to see England beat Venezuela and lift the 2017 FIFA Under-20 World Cup. England also had goalkeeper Freddy Woodman to thank as he saved a late Adalberto Penaranda panalty. Everton striker Calvert-Lewin broke the deadlock 10 minutes before the break in Suwon, the forward converting at the second attempt to put Paul Simpson’s side ahead in Sunday’s final. 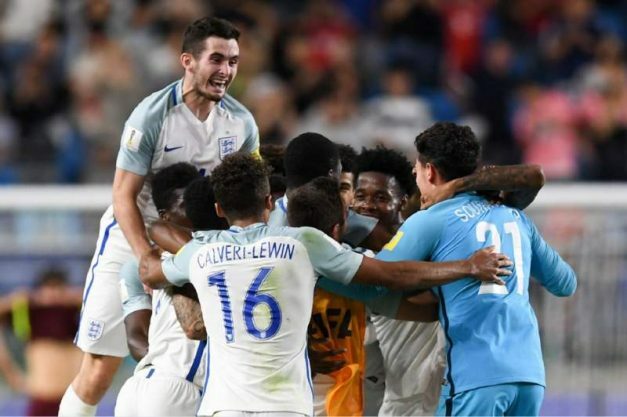 Penaranda then missed a spot kick for Venezuela in the 74th minute and England held firm in a nervy finish to be crowned world champions at Under-20 level for the first time. And England’s Dominic Solanke has been named the tournament’s best player ahead of Venezuela’s Yangel Herrera and Uruguay’s Federico Valverde. Italy’s Riccardo Orsolini grabbed the golden boot as the tournament’s top scorer with five goals – one more than Zambia’s Fashion Sakala, while England’s Freddy Woodman picked up the golden glove for best goalkeeper.